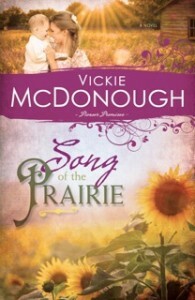 This entry was posted in Authors, Book Review, Giveaways and tagged Prairie Romance, Vickie McDonough by Carrie Turansky. Bookmark the permalink. I love to read authors bio on the research what went into writing their book. It does pay off because it is passed on to us because we get to read the books and this seems like a wonder series. Thanks for all the research that went into your book and series. I would love to read and your covers are beautiful. One of the fun aspects of research is visiting the area where your book is set. I really enjoyed the Mahaffie Stage Stop in Olathe, KS. It was there that I got the idea for my Pioneer Promises series. I’m glad you like the book covers. Another new-to-me author! This sounds great; I haven’t read anything quite like this! I hope you get a chance to read one of my books sometime. I like to add lots of exciting events to my stories. This book sounds sweet — a baby who needs rescuing?? I’m In! And with my mother’s family crossing the Kansas plains in a covered wagon just before my grandmother was born, I have a soft spot for Kansas, too. Would love to win the book! Susie, That’s so go that you know about your family’s heritage. And yes, poor Benjy needs someone to save him. Deanna, Thanks for stopping by Carrie’s blog today. Blessings! Enjoyed reading about the book. I grew up on the prairies of Eastern Colorado so know what they are like. I will have to read the book to see what the characters challenges were. Sounds good. Joye, That sounds like a lovely place to have lived. I have a series idea for one set in that area. Barbara, Thanks for reading my books. I think you’ll really like Aaron’s story. This book sounds great. Glad his story is told, but always sad when a series ends. I haven’t read any of Vickie’s books so this would be a great addition to my library. Shaun, Good luck in the book drawing. Thanks for stopping by today! Looks like a book that I really want to read. Hi Bonnie. I hope you get a chance to read one of my books sometime. Blessings! Sounds like a really good series. I’m going to check it out. Thanks for the chance to enter your give away. Thanks, Carol for visiting Carrie’s blog today. This sounds like a great book. Thank you for the chance to win a copy. Alice, I promise a happy ending with all of my books. Even though I often write series, each book has it’s own satisfying ending. Sounds like a great book! I love reading about how authors researched for their book! It is an interesting process! Thanks! Research can be monotonous at times, but then you’ll stumble on a fascinating jewel that captures your interest. Ooh, this book looks like so much fun! It’s always interesting to see a city girl go to the country and I LOVE marriage of convenience stories! Thank you for this opportunity! This sounds like such a sweet story about two very caring people. Thanks for the chance to win a copy! Brittany, People often say my book are sweet, but I do like to put lots of excitement in them. It keeps things interesting. Hi Patty, If you enjoy prairie romances, then you should love my Pioneer Promises series. I hope you get a chance to read it. The research sounds like it was fun. Another book to add to my list. The research trip I took to Kansas was lots of fun. There’s nothing like visiting the places you’re going to write about. Great interview . I have not read anything by this author , but it sounds good and always love to try new authors . Thanks fir the chance . Elizabeth, You might see if your local library has any of my books. That way you can try them out to see if you like my writing. I am always on the lookout for new books and ‘new-to-me authors’! I would love for a chance to read/win this book-thank you!! 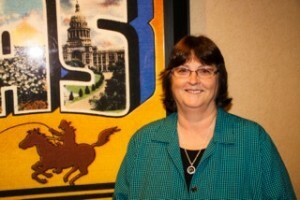 Good luck, Connie. I hope you get to read some of my books one of these days. I love how you do research for characters… 🙂 Opera! How fun. Thanks, Tami. An opera singer was a first for me. I don’t know a lot about it, but I think I did okay with Janie’s character. Not sure if I made a comment before but if not then I am now. Looks like a good read. I can’t recall that I’ve read one of Vickie’s books…I have found a want-to-read author! 🙂 This book sounds (pun intended) lovely. I imagine the research was melodic and fascinating. Thank you for a chance to win. Hi Kelly, I’d love to have you read some of my books. If you like suspense, I have one called Rancher Under Fire releasing next month. I have been reading this author and have read some of the series, would love to win this last book and read about the last brothers story. He sounds like a man who would be quite special. thanks for sharing interview with Vickie. Pauline, Thanks for reading some of my books. Aaron certainly is a good guy, and I was glad to see him finally find a good woman. Thanks for reading some of my books! That’s always fun to hear. I think you’ll like this series. Hi Patti. You spell your name the same way my sister does. 🙂 Blessings! Thanks, Angela! Most of the people who’ve read Song of the Prairie have enjoyed it. sounds like a ‘must-read’ for me!! Cyn, I hope you do get a chance to read Song of the Prairie. It’s an exciting book. Thank you for the opportunity to win a copy. It sounds like a good read! Carol, Thanks for visiting Carrie’s blog. Good luck in the drawing! I have not read any of Vickie’s work yet, but this series sounds interesting. I’ll have to put it on my list. Hi Lisa. Thanks for adding my book to your wish list! Blessings! What a lovely prize package you have put together for these different weeks of October. Thank you for the opportunity to win your book especially.